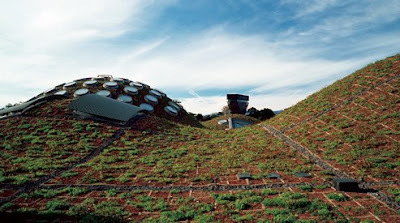 A few choice projects in the realm of Vegetated Architecture. Also, stay tuned for my review of the innaugural issue of GRHCs 'Living Architecture Monitor' of which they were kind enough to send me a copy. I perused it on the bus this evening, and it's definitely one of the better resources out there (more to come soon). But on to the projects. 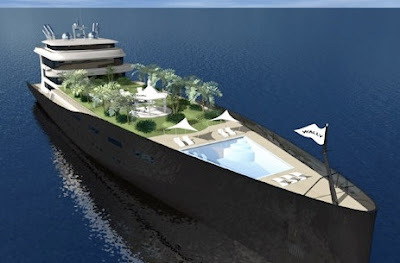 As we discuss Living Architecture, Vegetated Buildings, Vegetated Architecture or what ever you call it - there tends to be the span of the realistic to the visionary - and we definitely offer a selection of projects along this continuum. 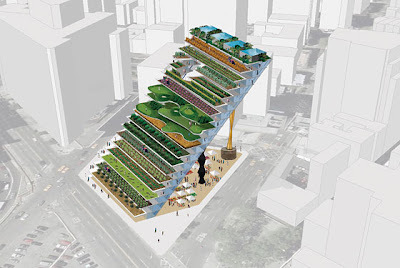 On the more utopian side of the scale is The Locavore Fantasia, a project that has some great visuals from Agro-architects (at least lately) Work Architecture Company, the folks whom recently brought us the stunning and simple Public Farm 1. 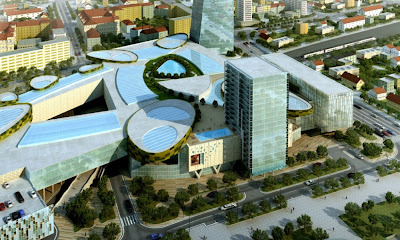 A couple from WAN (they cover the world - and a lot of this Veg.itecture is happening out there... not in here) starting with the Emonika City Centre in Slovenia by HOK International. City Centre is a nice way of saying 'mall' - although I've said before what better type of building to do some rooftop greening that massive shopping structures...? Although a bit more of that mass could've been greened up a bit aside from the central glass atria. The next project is a little difficult to discern. 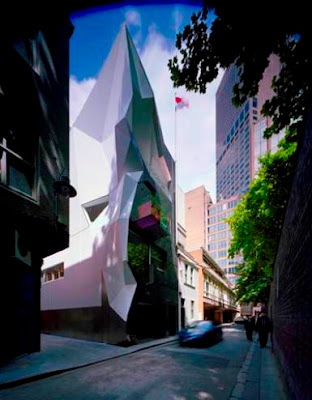 Monaco House in Melbourne is a project by McBride Charles Ryan which looks a little origami and contains ground-level retail with offices above. Vegetation is both functional as well as providing respite for workers: "Outdoor balconies provide areas of release from the office desk. The ‘green roofscape’ is similar space but also adds additional insulation to the upper floor." 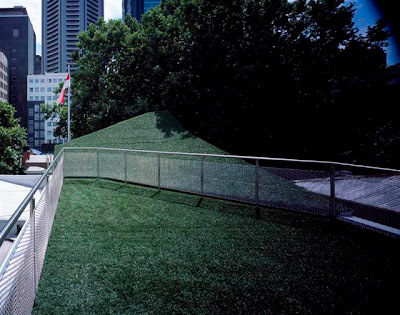 Although from the bottom photo, I have a really hard time figuring out what purpose and amenity this is supposed to bring, aside from putting green? 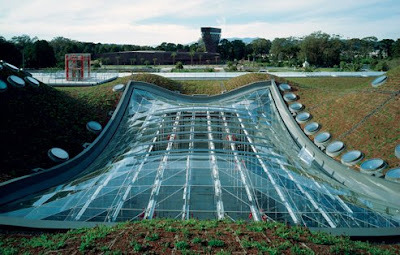 And what would a version of Veg.itecture be without some mega-project that has biomimicked a natural form. 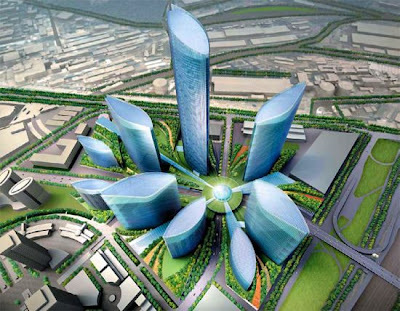 In this case The Design Blog offers Metropolia from Moscow, a business complex which takes the form of a very, very large lotus blossom. I'm not sure of the significance of the lotus in the Russian spirituality - but I'm sure that it may have something do to with the otherworldly power source emanating from the center. 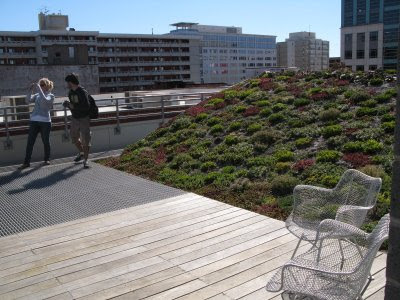 Now this... this is green roof with a $300/s.f. price tag... you go Wally!